At ITER, we don't brag. But we do like to mention the exceptional dimensions of the machine we are building: the ITER Tokamak will indeed include components that, in their category, are by far the largest in the world. In talks and presentations to the public it has become routine, for instance, to assert that the ITER cryostat will be the largest high-vacuum chamber ever built. But recently, a young postdoc attending a presentation on ITER at the Institute of Plasma Physics in Prague took issue with this claim. 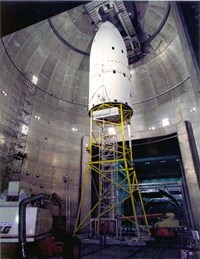 It's NASA's Space Power Facility, the student said, that holds the blue ribbon for the largest high-vacuum chamber. Located in Sandusky, Ohio (USA), the Space Power Facility was built in 1969 to create an environment comparable to that encountered in deep space, on the Moon or on planet Mars. It comes complete with high-vacuum, extreme cold (down to minus 195 °C) and solar radiation simulation. NASA has been using the facility for more than four decades to expose rocket components, space capsules, landing vehicles and satellite hardware to the harsh conditions of outer space. Its futuristic setting has also inspired movie makers: in 2012 the opening sequences of the blockbuster The Avengers were filmed there. The cylindrical vacuum chamber is 30 metres in diameter and 37 metres in height—bigger, it's true, than the 29.4 x 29 metre ITER cryostat. 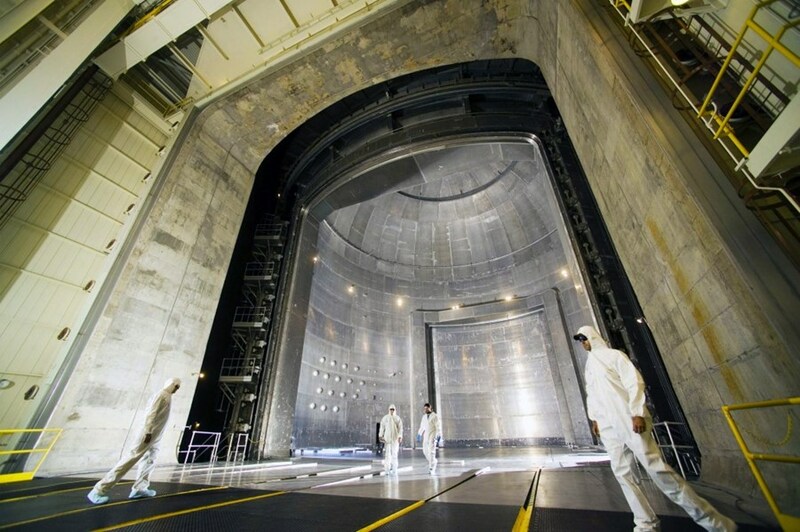 There is however an important difference between the two: while the aluminium Space Power Facility's test chamber is spectacularly empty (after all, rocket stages have to fit in) the steel ITER cryostat is a very crowded place. In ITER, because of the volume occupied by components such as magnets, support structures, the thermal shield and the vacuum vessel itself, the pump volume inside the cryostat—that is, the total volume of the chamber minus that of the components—is reduced to 8,500 cubic metres. At the NASA facility, it is almost three times larger (23,500 cubic metres). In order to achieve high vacuum up to 10-6 Torr, one millionth time more tenuous than the Earth's atmosphere, both installations use mechanical roughing pumps to go down to ~ 0.1 Torr, and then cryopumps to achieve the required high vacuum. While NASA's installation can achieve high vacuum in 8 to 12 hours, the ITER cryostat will require about twice this time. "However, the two systems are quite different," notes Matthias Dremel, an engineer in the ITER Vacuum Section. "The ITER cryostat contains thermal shields cooled to 80 K that act as pumps by condensation of the gases. What's more, the magnets behind the thermal shield, cooled to ~4 K, also act as pumps by condensation." Because these components are extremely cold, they significantly contribute to removing the impurities that remain in the chamber. Atoms, molecules and particles are all captured by cold surfaces: the more intense the cold ... the more irresistible its holding power. In the ITER cryostat and in NASA's Space Power Facility we have two high vacuum chambers of approximately the same size but the latter, however spectacular, is but a big empty aluminium cylinder. The ITER cryostat, on the other hand, is a highly complex structure that must remain absolutely leak-tight despite the thousands of lines and feed-throughs that penetrate it for cryo, water, electricity, sensors, etc. So it's a NASA win (but not by much) when it comes to size, but when it comes to complexity—the ITER cryostat remains unchallenged by far.